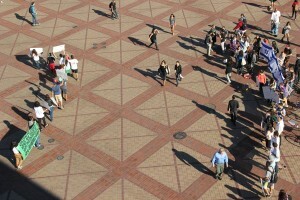 After a volatile week of fighting between Israelis and Palestinians, students in support of Palestine (left) held a rally by Tommy Trojan on Monday. In response, students supporting Israel (right) held flags and signs across from the rally. Reactions to the gatherings ranged from confusion to support. Congratulations, Israel. You have completely and utterly destroyed the lives of millions of people. Gaza is in rubble–no running water, no food, no power, no work, nowhere to live, no schools, no freedom, no dignity, NOTHING. As is the official Israeli Government position–You have strangled Gaza to death. Your God must be very pleased. These policies of Israel are a disgrace to humanity. 40% of Gaza is children under 14 years old. Of course they hate Israel–you have backed them into a corner and taken EVERYTHING from them. Time to fess up, Israel– the enemy is you. MURDER as cover for THEFT is *not* SELF-DEFENSE. War historian Gwynn Dyer noted that everyone would support outlawing war as long as you get to choose the point at which you freeze the circumstances. Although this is a non-biased review of the peaceful on-campus protests earlier this week, I think it is incredibly important to maintain an unbiased, factually supported stance. There is no such thing as Palestine. I’m neither for Israel nor for the Palestinians, but Palestine is not a country. Let’s not refer to it as such and cause confusion / spread fallacies.